Many runners can run continuously from start to finish without ever slowing down. But that strategy doesn’t fit everyone. When training for my first half-marathon, I’d gotten up to four miles without stopping. My heart soared with pride, but my knees seared with pain! After getting advice from seasoned runners, I attempted a strategy from expert, Jeff Galloway. 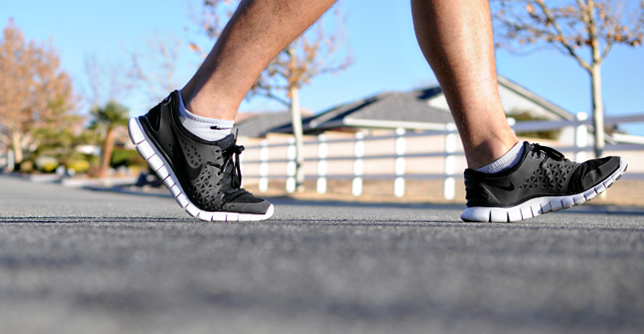 His premise is that if you incorporate short walks in between spurts of running, you’ll avoid exhaustion and injury. It also conserves your body’s resources and allows for quicker recovery. Now I run for five minutes and walk for one minute. After falling into this routine, I realized two crucial things. First, this strategy gave my knees a rest in between my spurts of running. I was able to increase my mileage each week without any further discomfort. No pain! Second, I realized these short breaks of walking gave me a mental break. Instead of thinking, Wow—I’ve got to run multiple miles today, it was easier to think, Okay—I can run for the next five minutes; but then I’ll get a break. I embraced this strategy! Much more doable than running full force without stopping. Who are we to think we can keep running and not slow down on this journey of faith we find ourselves on? We falsely think we can keep going at a break-neck pace, but God designed us to intentionally slow down at specific times on our race of faith. One minute walks paint a picture of our time to be still with God. Life is often weary. We feel as if we’ll faint at the next announcement of bad news. We are so easily overcome with stress, worry and anxiety. But when we continue at full steam with no intention of slowing down, we feel overcome with exhaustion and pain we simply can’t handle. We must be intentional in carving out time with Jesus. Time to rest. Time to be renewed and refreshed. Time to just be still in His presence. We’re called to soar like an eagle, not rage mindlessly like a hamster on a wheel. Our quiet time with Him prepares us to go back out on the course of life and keep going. Our time in prayer keeps us connected with Him, allowing us to breathe easier when life unexpectedly shakes us up. This whole run/walk approach gives us a new perspective on how we ought to view the challenges that seem insurmountable at different seasons of life. When it says in Isaiah that we soar on wings like an eagle, it means we get an eagle’s perspective. Just as an eagle soars above the storm and sees the bigger picture, we too can get that same perspective if our hope is truly in God. So when I get overwhelmed with a long-term challenge facing me, I can choose to run and not grow weary. I can choose to walk and not faint. Why? Because my hope is in Him. Ready? Is there an area of your life in which God is asking you to slow down? Where do you need to walk with God instead of running in your own strength? Take time to be still before Him so He can give you the eagle’s perspective.